Turf toe is a term used to describe a sprain of the ligaments surrounding the joint of the big toe. This type of injury is typically had when the toe bends into a hyper-extended position, which occurs most frequently from the ‘pushing-off’ position seen in runners pushing off the block into a sprint, and in American football players at the start of play. It is not the pushing off that causes injury but the jamming of the big toe into the ground or forcefully and repeatedly pushing of from the toe over a long period of time. 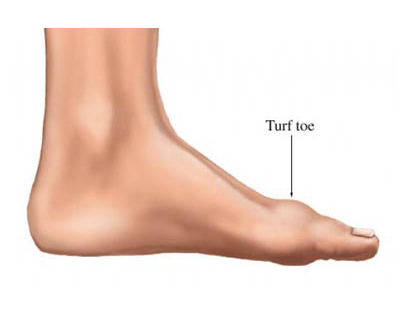 Because this injury is particularly prevalent in American football players—especially after artificial turf replaces real grass—it garnered the nickname ‘turf toe’. The problem with artificial turf is that it’s a much harder surface than grass and it is much less shock absorbent, which means that the forceful energy generated by this movement is often reabsorbed by the athlete—and their big toe. While joint sprains of the big toe are most often associated with American football this type of injury can be sustained while participating in a wide variety of sports and activities. The big toe is comprised of two joints, the larger of the two being the metatarsophalangeal joint, or MTP. This joint is found where the first long bone found on the inside of the foot (the metatarsal) connects to the first bone of the toe (the phalanx). Plantar Plate: A thick, fibrous tissue runs under the metatarsophalangeal (MTP) joint to prevent the big toe from bending too far toward the shin (dorsiflexion). Flexor Hallucis Brevis: This tendon runs under the first metatarsal bone and connects to the base of the phalanx of the great toe in order to provide strength and stability to the entire toe during ‘push-off’, or similar motions that place the same kind of stress on the joint. Sesamoids: Sesamoids are bones that are embedded in a tendon; in this case, the two small bones can be found with the flexor hallucis tendon, and their job is to facilitate ease of movement. These particular sesimoids also help stabilize the MTP joint by bearing some of the weight that is routinely placed on the front of the foot. Collateral Ligaments: Medial and lateral ligaments help to stabilize the big toe. These particular collateral ligaments run along each side of the toe, connecting the phalanx bone to the metatarsal and help to prevent the toe from exaggerated varus and valgus forces (side-to-side movement). Turf toe typically refers to a sprain of the ligaments surrounding the big toe but includes an injury of any soft tissues in the plantar complex, including the flexor hallucis brevis or a collateral ligament. Turf toe injuries vary in severity. Injury is said to occur when there is excessive stretching of the soft tissues, partial tearing of the soft tissue, and/or complete dislocation of the MTP joint. Doctors grade the injuries on a scale of 1 to 3; one being the mildest level of injury and three being the most severe. Not only does this make it easy to quickly communicate the severity of the injury but it helps them outline treatment options. Grade 1: When one or more elements in the plantar complex has been stretched too far, causing pin-point tenderness and mild swelling the injury is considered the mildest. Grade 2: When one or more elements in the plantar complex become partial torn the tenderness is more widespread, the swelling moderate and visible bruising often occurs. Movement of the great toe is greatly reduced and causes discomfort. Grade 3. When one or more elements in the plantar complex are completely torn tenderness becomes acute, swelling is severe, and bruising can be significant. Moving the big toe presents great difficulty and is very painful. This is the most serious level of injury. Turf toe is a risk in any sport or recreational activity that demands the forefoot be flexed with the heel raised in preparation for a ‘push-off’, the force of which pushes the big toe into hyperextension. As previously noted, this injury occurs most frequently among American football players who routinely play on artificial grass, or ‘field turf’. Because artificial surfaces have a tendency to be much firmer and less shock absorbent these athletes use specially designed athletic footwear to compensate for the harshness of playing on such an unforgiving surface. Problems still occur however; because the shoe is softer and more flexible (allowing for greater agility) it absorbs more of the force of impact but provides much less stability in the forefoot. Rest: Rest indicates completion cessation of the activity that caused the injury and a reduction or complete avoidance of weight-bearing activities such as jumping and running. Care must be taken even walking in order to avoid putting weight on the injured body part. Ice: Ice refers to ‘cold’ here; applying an ice pack to an injured toe reduces inflammation and swelling. Apply the ice for no more than 15-20 minutes at a time, several times a day. Applying ice for more than 15-20 minutes at a time may cause further injury. Never apply ice directly to the skin; use a t-shirt or towel to protect the tissue. Compression: Wrap the injured element in compression bandages to help prevent additional swelling. Elevation: Elevate the leg higher than the heart when resting. This too will significantly help to reduce swelling and prevent further swelling. To reduce swelling, recline when you rest, and keep your leg higher than your heart. Over-the-counter non-steroidal anti-inflammatory medications such as ibuprofen or aspirin are often used to relieve inflammation and the discomfort associated with inflammation. If the injury is severe or symptoms persist or worsen the best thing to do is cease self-treatment and seek medical attention. Be ready to explain the cause of the injury, provide a detailed description of your symptoms, and advise your doctor of the treatment methods you have been using. 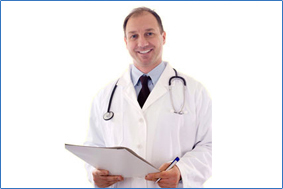 The more information you give your doctor the more accurately he or she will be able to treat you. Should you find yourself in your doctor’s office seeking treatment you will probably discuss your general health and the specific symptoms and nature of your injury. The next part of the examination will be physical. Your doctor will examine your foot for signs of swelling, bruising, and the degree of motion in your MTP (metatarsophalangeal) joint. This part of the examination may be uncomfortable as your doctor will have to grasp the injured digit and bend it up and down as well as side to side. This will reveal any instability in the plantar complex, which indicates that there may be a tear in one or more of the tissue. A range of motion test may be performed on the uninjured toe in order to compare the two. Your doctor will bend your toe up, move it up and down, and side to side, looking for instability that might suggest a tear in the plantar complex. He or she may also perform the same range of motion tests on your healthy toe as a comparison. Because the range of motion tests may be painful your doctor may suggest an injection to help numb the general area of the toe that is injured. This should greatly reduce the degree of discomfort that can occur during the examination. X-Rays: An x-ray is a medical image that performs best on dense, hard structures—bones being a prime example. An x-ray creates a clear picture of the bones inside your foot. This allows your doctor to see if there are any other problems with the toes, such as smaller, multiple fractures that may occur at the point where the plantar complex attaches to the bone as well as any damage that may have been done to the sesamoid bones in that area. Magnetic Resonance Imaging (MRI) Scan: MRI`s are particularly adept at creating high quality images of the soft tissue within the body. Any injury sustained by cartilage tissues will be revealed in this type of image. An MRI may be used if an x-ray scan revealed abnormalities of the foot or toe, or when the injury has already been identified as a Grade 2 or Grade 3 injury. Pain levels at the lowest grade are usually tolerable and most athletes continue participating in their event or sport using an activity appropriate still-soled shoe. 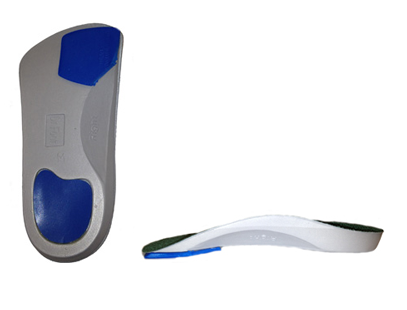 Orthotic devices such as light, thin, carbon graphite shoe inserts can help reduce the amount of tension placed on the plantar plate, particularly when there is a rigid forefoot component. The RICE protocol is a highly effective treatment method for turf toe. Your doctor will probably recommend Rest, Ice, Compression, and Elevation as a way to reduce swelling and discomfort. Temporary fusion: Taping the big toe to the toe beside it will stabilize the injured digit and prevent it from moving too much, which can aggravate tender tissues and prolong the healing process. At this injury level immobilization of the MTP joint is essential. A walking boot may be used for up to one week if necessary. Following the use of the boot Grade 2 injuries are typically managed with the same treatment options as a Grade 1 injury. Using proper taping techniques and a careful intake of NSAIDS often have a notable impact at this grade of injury. Three to fourteen days of rest are usually recommended before the injured party returns to sporting or recreational activities. Immobilization and rest often lasts for several weeks. 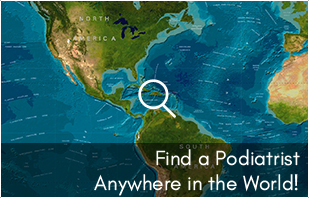 A walking boot or cast will be used to maintain a partially downward pointing position of the great toe. Physical therapy is often effective and should begin as soon as possible in order to prevent or reduce joint stiffness. Specific exercises will be used to help stretch and strengthen the great toe. As the injury begins to heal Grade 2 level treatment will be implemented. Afterward, Grade 1 treatments will be applied until healing is complete and treatment of any kind is no longer necessary. The exact surgical procedure used will depend on the nature of the injury. The aim of the surgery is soft tissue repair and restoration of MTP joint movement so that normal use of the great toe can be both restored and preserved. Orthotics can can take pressure off the 1st metatarsal. Dr Foot Pro Hallux Rigidus Insoles have a 4 degree forefoot 1st metatarsal post to redistrubtre pressure away from the 1st metatarsal joint, only use these insoles if you have been diagnosed with Hallux Rigidus or Turf Toe. Long-term outcomes depend on the type of injury and level of intervention; injuries that are immediately addressed usually heal very well and have the least complications. Long-term complications that often develop with turf toe include reduced or minimal push-off strength, a ‘cocking-up’ of the great toe during push-off, and bunion development that interferes with the level of play. Mild to moderate symptoms such as joint pain and stiffness may persist over time and are the most frequent complication when it comes to this type of injury. Turf toe is not considered a major injury but nonetheless should be addressed early on in order to promote the best outcomes possible.